Friday morning dawned snowy and quiet at the University of Virginia, but the Rotunda’s Dome Room was abuzz with activity and excitement. 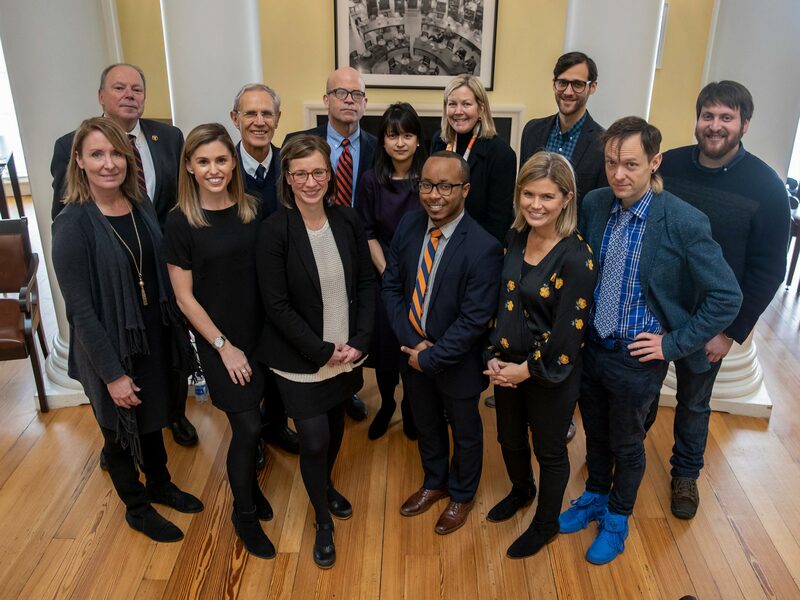 They were all there for a big announcement, one that Ryan called “easily the biggest and most exciting news” of his presidency so far: The University is planning a new School of Data Science, made possible by the largest private gift in UVA’s history. 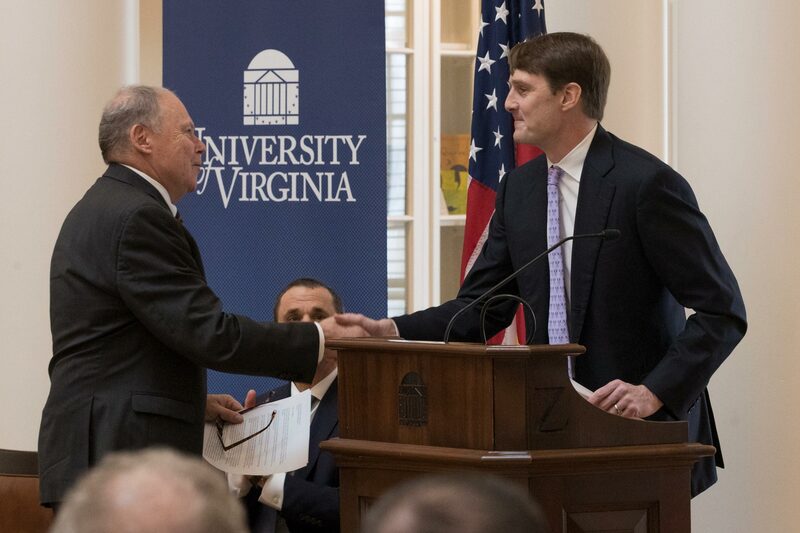 The new school – UVA’s 12th, and the first established since 2007 – was made possible by a supporting gift of $120 million from the Quantitative Foundation, based in Charlottesville and led by Jaffray Woodriff and his wife, Merrill Woodriff, both UVA graduates. “An exciting vision is emerging, and my hope is that we can build one of the most advanced and comprehensive schools of data science in the world, focused on using data in service of the public good,” Ryan said. Jaffray Woodriff, taking the podium after Ryan, said that building a school around data science will position UVA as a pioneer in the field. Woodriff and Ryan both pointed out that advancement in data science does not come without challenges and ethical questions – questions that UVA faculty and students can help answer. The new school is still in the design phase, and the University continues to seek input and necessary approvals from multiple groups, including the Faculty Senate, Board of Visitors and ultimately the State Council of Higher Education for Virginia. It will build on work already done by the Data Science Institute, a pan-University institute established in 2013 that grants graduate degrees and conducts research. A $10 million grant from the Quantitative Foundation helped to establish the institute in 2013. “Plans for this school are unique and the University has put great thought into how it will be true to UVA’s roots, by focusing on outstanding faculty as well as ensuring that the experience data science students have here will be unlike experiences they could have anywhere else,” Woodriff said, thanking both Ryan and President Emerita Teresa A. Sullivan for their support in envisioning and planning for the new school. Phil Bourne, who directs the Data Science Institute and will serve as the new school’s acting dean, said the school will focus on interdisciplinary collaboration. Satellites and centers embedded in other schools around UVA will facilitate data science work in a variety of disciplines, including data acquisition, engineering, analytics, data visualization and dissemination, and ethics, policy and law. “A school of data science must help drive this world appropriately to profound change,” he said. In their remarks, Northam and Riggleman, as well as Sens. Warner and Kaine, said that developing talent in the emerging field is critically important to the future of the commonwealth. 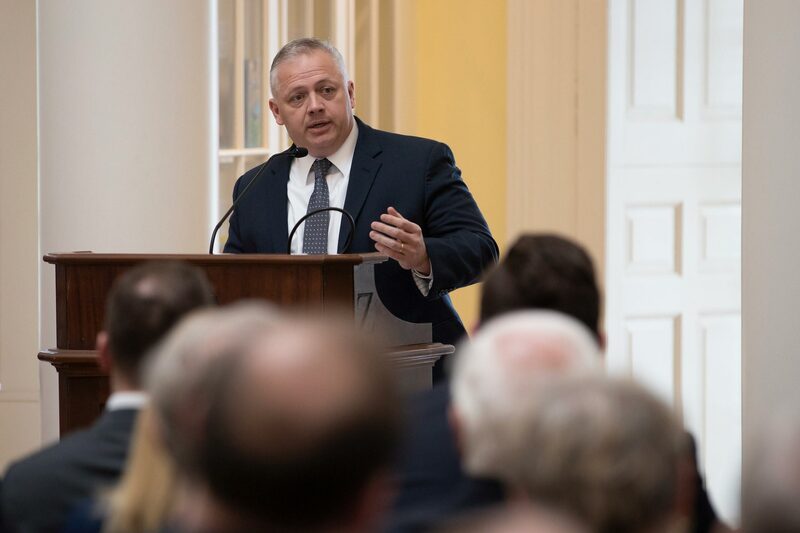 Riggleman, an alumnus who said the event marked an emotional return to UVA for him, applauded “the vision and forward thinking of those that have spoken about data science” and noted that he had seen the field’s potential impact firsthand while serving in the Air Force. A representative read a statement from Kaine, who said he was proud that Virginia would be home to one of the first schools of data science in the nation. Sign up for the Daily Report, your free, comprehensive source for all UVA News. Warner seconded his colleague’s congratulations in a video statement recorded from Capitol Hill. 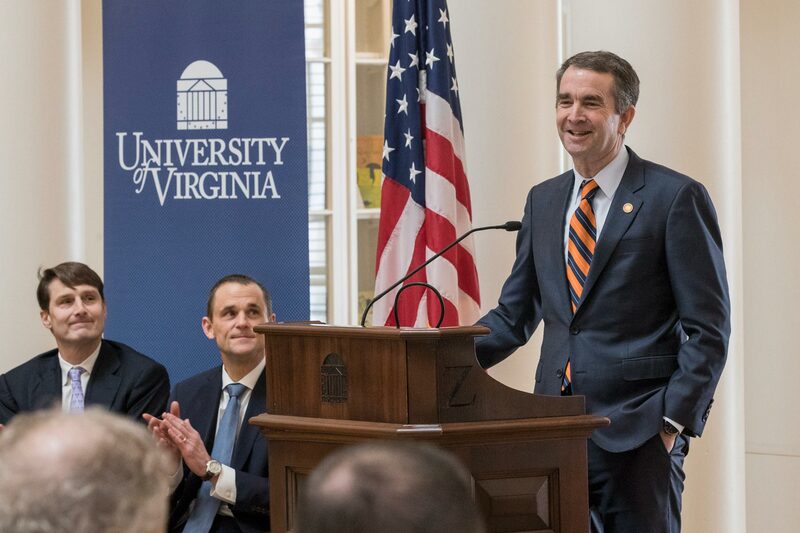 “UVA will once again stake out a leadership position not only for Virginia, but for the country and the world,” Warner said. 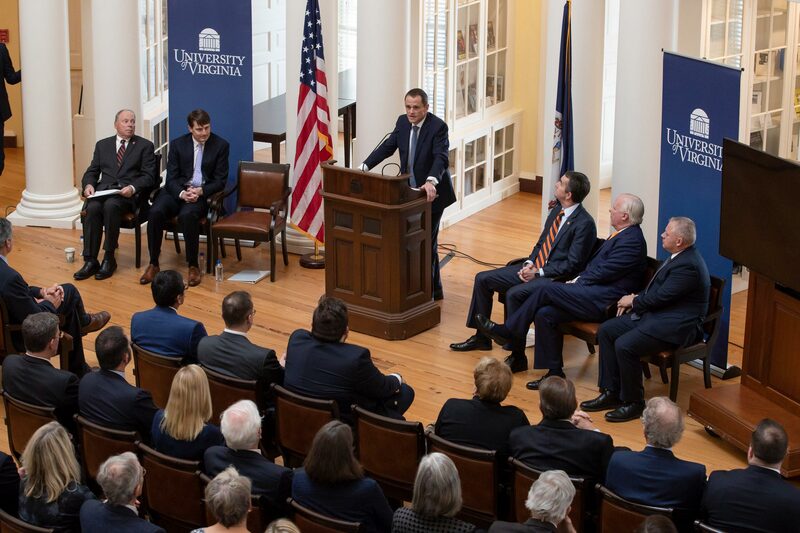 Northam concluded the event by noting that the new school will be a valuable asset as Virginia works to develop and attract top technology firms and innovators in a variety of fields. He particularly noted Amazon’s recently announced expansion in Northern Virginia, which is expected to create a variety of tech jobs, as well as educational opportunities.